The research title says it all: “Improve Remote Education Using Telepresence Robots with Social Capacities.” The associated possibilities for educational advancement are endless. Southern Illinois University Edwardsville School of Engineering’s Mingshao Zhang, PhD, assistant professor in the Department of Mechanical Engineering, continues his development of a remote educational robotic system that is easy-to-use and low cost for the benefit of learners worldwide. 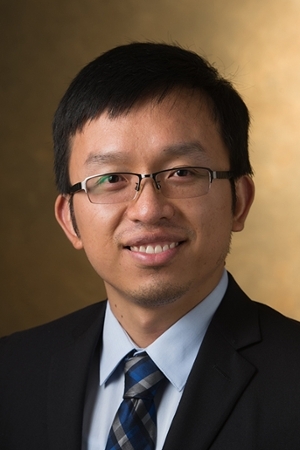 As a 2018-19 faculty fellow with the SIUE Center for Science, Technology, Engineering and Mathematics (STEM) Research, Education and Outreach, Zhang is collaborating with pedagogical experts to meet his research goals of increasing instructor credibility by enhancing usability and maximizing student learning outcomes. Zhang’s innovative remote teaching platform includes features of telepresence robots and social robots, which are autonomous robots that interact and communicate with humans by following social behaviors and rules. The need for an accessible and usable platform derived from Zhang’s personal experience. Through his work as a STEM Center Faculty Fellow, Zhang published and presented a conference paper entitled, “Development of Telepresence Teaching Robots with Social Capabilities” at the American Society of Mechanical Engineering’s 2018 International Mechanical Engineering Congress and Exposition. His work, “Use SLAM to Improve the Social Capabilities of Telepresence Teaching Robots,” has been accepted to the 2019 American Society for Engineering Education’s Illinois-Indiana Section Conference. The STEM Faculty Research Fellows program provides funds that free up a portion of faculty time for testing classroom innovations, and gives access to the Center’s educational researchers to help assess student outcomes. STEM Center educational researchers also collaborate with the fellows to prepare proposals to external funding agencies for additional research and institutionalization of effective STEM education practices. The STEM Faculty Research Fellows program welcomes applicants from any field who have innovative ideas for a project that could improve undergraduate STEM learning. Interested applicants may apply at siuestemcenter.org/stem-research-fellowship. 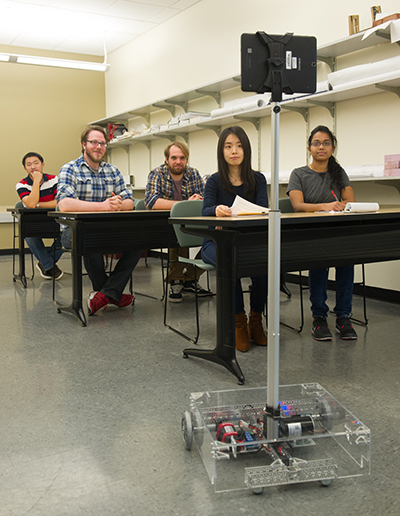 SIUE School of Engineering student researchers test the telepresence robot created for educational settings.